When should one use Outlook, and when Hotmail? Is there any significant difference for live.com accounts? As it seems, live.com accounts can be set either by using Outlook or Hotmail choice in WP. I didn't notice any visible difference between these two settings, so wonder if I'm missing something? When should one use Outlook, and when Hotmail? If your primary concern is getting your web hotmail.com or outlook.com email account synced, then you can choose either. 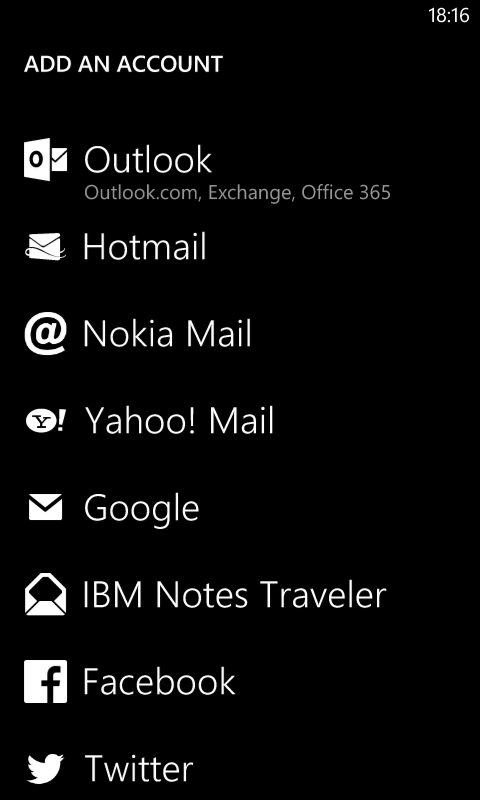 Hotmail.com has been upgraded and re-branded to Outlook.com. However, the brand name Outlook is more than just the web client outlook.com. It can be used as a stand-alone application, or can work with Microsoft Exchange Server and Microsoft SharePoint Server for multiple users in an organization, such as shared mailboxes and calendars, Exchange public folders, SharePoint lists, and meeting schedules. There are third-party add-on applications that integrate Outlook with devices such as BlackBerry mobile phones and with other software such as Office and Skype internet communication. In other words, if you need to sync with Office 365 or MS exchange, you should pick Outlook as the account to add.